The process of grieving is different for all of us; it can be based on our culture, religion or family traditions. But one thing is certain, in doing so we rend homage to loved ones and pass the knowledge of their life down generations, so they will always be remembered. We have discover this emotional “goodbye” is found within the animal kingdom, certain species share this ceremony and even have their own grieving process, albeit displaying it differently and sometimes contradictory to what we expect. 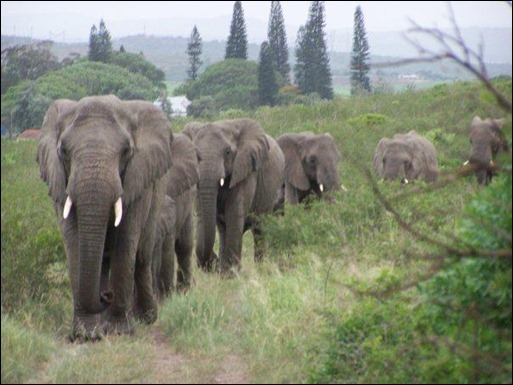 The elephants were relocated to ThulaThula but not everything went smoothly. A mother and her daughter were shot and killed in the moving process, making the aggression of the animals towards humans reach a violent nature. After arriving, the matriarch Nana, guided the herd around the perimeter of the electrical barrier, touching the wire with her trunk, testing the fence. That same night, her and her sister Frankie, worked together to push a tree onto the electric generator of the fence and made their escape. Lawrence had to fight for the elephants to not be killed, once out of the reservation they were fair game for poachers, local villagers and hunters who would shoot them on sight. 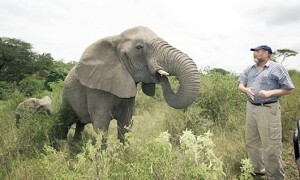 After this Lawrence made a life changing decision, he went to live with the elephants. In his book he recounts the pains and obstacles he went through to reach his goal: the trust and friendship of the herd and ultimately their love and respect. He and his wife became so close with the elephants, than when his first grandchild was born, he went down to show the child to the herd, earning a lengthy silent treatment from his daughter in law. The herds had been away for one and a half years, till that fateful Sunday, when they came marching back. How did they know that their human friend was gone so suddenly? Did they develop a connection so strong they felt the emptiness of his parting, like the ripples in a pond? No one can answer for sure, all we can be sure is that amid the turmoil of their fear, they found a friend who would listen and protect them. Lawrence said they taught him how to understand, through whispers in the air; perhaps this visit was to whisper a last goodbye. “The Elephant Whisperer: Learning about Life, Loyalty and Freedom from a remarkable herd of elephants” by Anthony Lawrence and Spence Graham. This entry was posted in Uncategorized and tagged africa, anthony lawrence, elephants, nature by Femina Invicta. Bookmark the permalink.